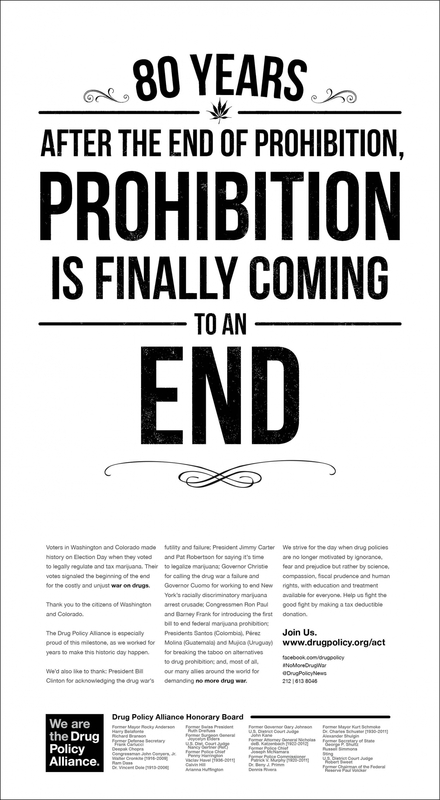 Tomorrow’s New York Times will feature a full page advertisement from our friends at the Drug Policy Alliance, acknowledging what a remarkable year it has been for cannabis law reform in the United States, and around the world. Thank You Mr.Nadelmann for the full page ad acknowledging such a historic event. If it weren’t for the DPA and NORML I don’t think we’d be were we are today in the fight against prohibition. 2012 saw the ALL OUT legalization of Cannabis in Colorado & Washington state! I HOPE 2013 will be the END of Cannabis Prohibition in EVERY state!!! I’ve always seen the war on pot as a two part problem. First, there’s the ignorance about the drug. Then, there are those who profit from that ignorance. I would like to see marijuana be legalized completely, but something even more important, vastly, more important, I want to see an end to lives being ruined or ended on both sides over something that is and always has been virtually harmless. Schedule One status is based on ‘no medicinal value’ and when the worldwide medical community shot that lie down, prohibition should have ended immediately. In the past, people didn’t want to sign petitions because they were afraid. We don’t have to be afraid anymore. Sign the petitions ! Sign every single petition !Let’s get this done ! …and…while the US is celebrating the end of prohibition,the northern canadian neighbors are facing the worst prohibition on marijuana this country has ever faced. thanks to Stephen Harper and Rob Nicholson regressive politics.It is as if the LeDain commission and the Senate Report on marijuana simply never existed or were never written.Terrible times to live in Canada,land of the oppressed. Is it just me, or is there a mistake in the ad? Shouldn’t it say, “80 YEARS AFTER THE START…” (not “END” there)? I think it’s great that the DPA said ran this ad in the NYT, thanking WA and CO for the amazing thing of legalizing and regulating marijuana, and thanking those important people who are favoring the movement. I am so thankful that I am seeing this happen in my lifetime. And thanks to NORML for all you do to make this happen, and for putting up the links to good stuff like this ad. hang in there bb54. Once the united states legalizes and taxes pot Canada will not be far behind. I have faith in this. Thankfully I don’t live in Canada. Seattle has not fallen to ruin. We had to ease into legalization with intitiative 75 which made Marijuana for personal use the lowest priority of the Seattle Police Department. They have been more or less looking the other way since 2003. With that kind of attitude it was just a matter of time before it was legalized. Initiative 75 was a test. I KNEW Washington would be first to legalize. New York will be the last. Why would saying that prohibition ended 80 years ago be a mistake? There is no mistake in the ad, prohibition did END 80 years ago, maybe look into studying or reading up on some history before you start accusing people of making a mistake when the only mistake is your own ignorance. You really think they would allow an ad like this to be published in the NYTimes at a astronomical expense with a glaring mistake like you suggest? I don’t think so, scooter. Prohibition of Marijuana is the same exact stupid and evil thing as Prohibition of Alcohol. Criminals should never be given more rights than law abiding citizens; which is exactly what Prohibition does. It gives money to those killing the innocent and those who hunt them creating war. We then get shot or arrested in the crossfire. People selling marijuana deserve police protection same as everyone else not stripped of our rights and threatened by gangsters.